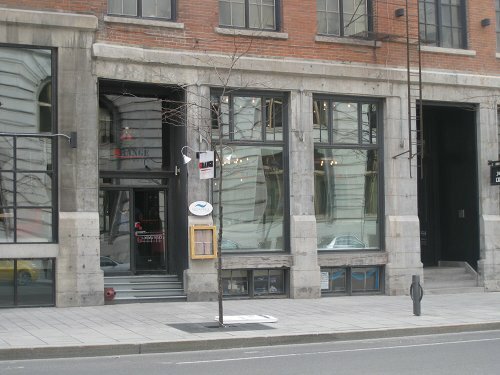 Situated on McGill street in old Montreal, Grange is mix of funky new cuisine meets wooden comfort. 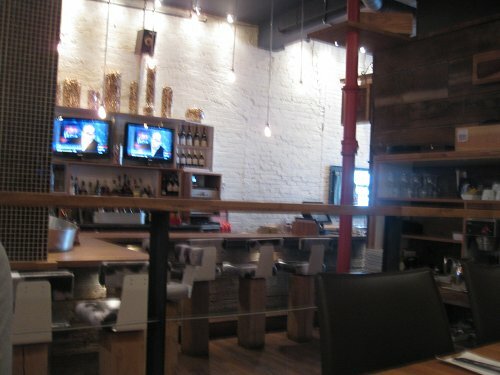 The interior is warm and comfortable with lots of wood giving it that part rustic, part refined feeling. The initial entrance area looks small with a long narrow bar, a wine cellar on the southern wall, but then you notice a much larger dining section near the open kitchen and you can see how this place can hold 150 people. When we walked in, it was pretty quiet and there were a few groups scattered around so we were fortunate and were able to get a nice table in a perfect spot. The menu is a brief one pager with various dishes that are not your run of the mill breakfast fare. The dishes are inspired by North American breakfast aspects but then offer slight differences and refinement such as their waffles with raisins and rhum, an egg presented in a mini frying pan with chorizo, potatoes and lettuce, a breakfast sandwich comes as a mini slider and they even have oysters. This should give you an idea of what the menu is like. They also do an interesting twist by having a tapas style menu with item sizes being smaller and prices in the $5-$7 range. This make their brunch experience very fun in that you can sample various different dishes and embark on a brunch adventure. We started off with some café lattes ($4.00) since they did not have drip coffee. 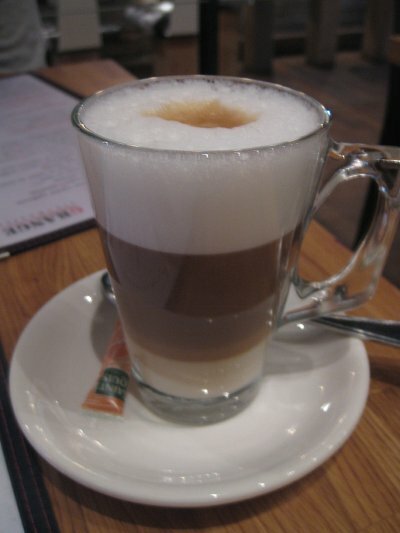 The latte was quite good but I really like a drip coffee in the morning, I know its not fancy but it just warms me up. For the food, we started off with an egg plate served with chorizo and potatoes ($5.00). 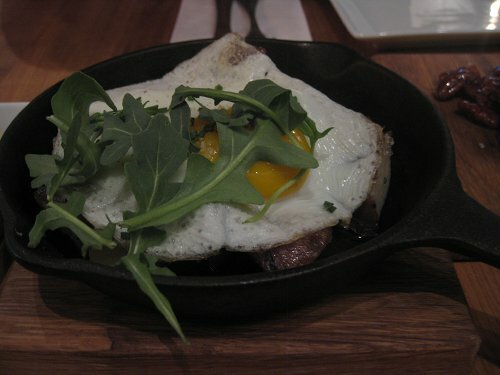 The plate was actually a mini frying pan with a fried egg served on top of the chorizo and potatoes. This dish was as nice to look at as it was tasty. The chorizo pieces were quite generous and the potatoes were nicely seasoned. 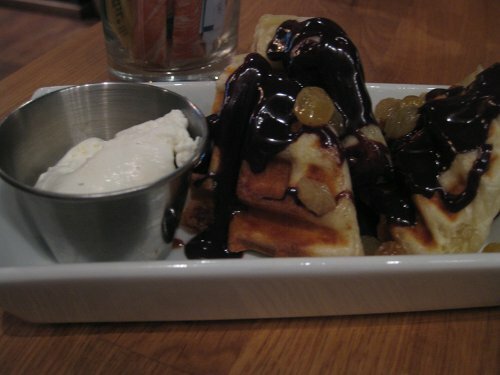 We then had the waffles ($5.00) that came with a chocolate sauce, raisins and a side of cream. The waffle was quite different from the normal waffles I’m used to. The overall size was not as large and the outside was a little crispier but he inside was still warm and fluffy. In fact, it is probably closer to a classic Belgium waffle than it is to the normal breakfast waffles we are used to here. Regardless of what it kind of waffle it is, the taste was 100%. The chocolate had a touch of that classic bitter chocolate taste without overpowering the dish, and the raisins are a nice addition to it, offering a little natural sweetness. We also had Blue & confiture ($6.00) which was quite different to anything I have seen before. 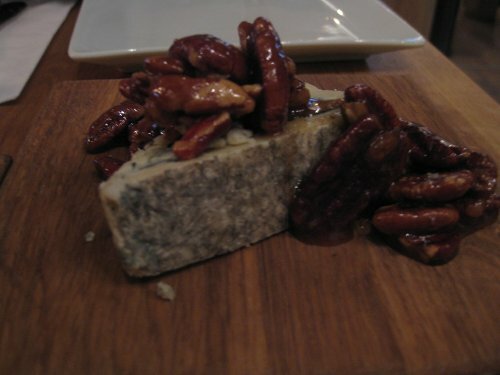 It was a nice piece of blue cheese, pecans and a dark brown sugar sauce glazed on top. Initially we felt we ordered something wrong since one would not expect blue cheese as a breakfast dish, but since I love cheese and blue cheese is one of my favourites I was very happy with this dish. It actually works well in the morning and the nuts go well with this dish. The cheeses taste had a nice presence but did not overpower the dish so that helped with the enjoyment of the meal.There was something outrageously delicious about the combination of the smokey blue cheese and sweetness of the glaze dressing. After these two items we felt that in the spirit of our tapas style brunch experience we should order more, and that is exactly what we did. So we ordered two more items. 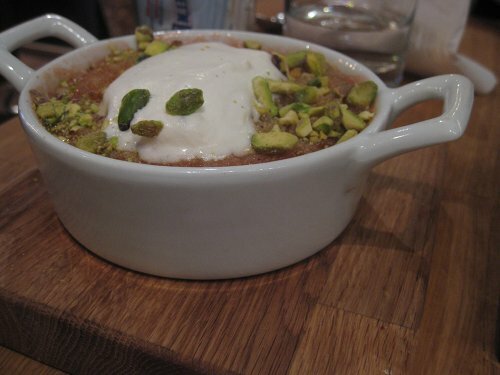 One of which was the Croustade ($6.00) which is pot of warm fruit with pistachios. The colour is kind of pinkish and looks odd but wow the taste really delivered. I think this was one of my favourite dishes. The natural sweetness of apples and strawberry was nice and warm and the paring with peach was great. I could have eaten two more of these, it was that good. 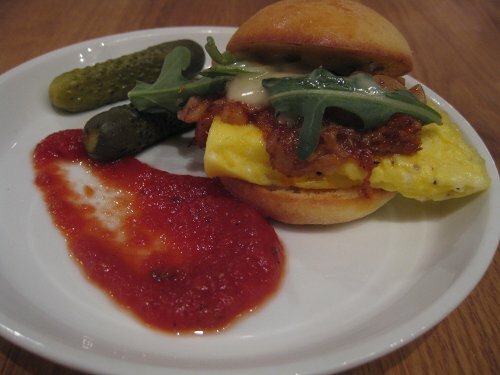 Lastly we ordered the Mc Grange ($5.00) which is a mini breakfast sandwich with mini burger buns, an omelette inside, some sauce, bacon, lettuce, two mini pickles and a nice tangy red sauce on the side. This bite sized treat was bursting with taste. The pickles was a nice touch and although the sauce on the side was tasty it did not do it for me but that’s just my personal preference. I’m sure most other people will love it. Our waiter was really nice and passed by and refilled our water often and he was very descriptive with the menu since most of the items were new to us. It was nice to have someone keep tabs on us often. There are some vegetarian options on the menu that you can safely order. There are a couple meat based dishes but there are other choices which should make any vegetarian satisfied. As for vegans, sadly there is nothing I could find that you could order. I really like the tapas theme we did. The menu is not explicitly stating it is a tapas menu but the portion sizes make sense and the prices are in the $5-$6 range so that makes it fair. Our bill came out to over $30 but that is with coffees which did not have free refills. This is a great place to go with a group and try out new unique dishes and share them. A group of 3-5 people is probably optimal since you can only share some dishes so many ways if everyone wants a taste. I suggest you check this place out. There were not too many people there when we were so get there before it starts filling up or you might have to wait in line..